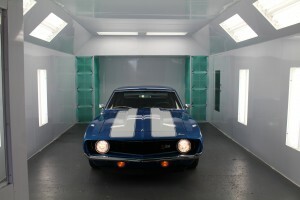 Powder coating offers brilliant white booths! Powder coating is the fastest growing finishing technology in North America, representing over 10% of all industrial finishing applications. So what is a Powder Coated Finish? Have you ever seen a really shiny and clean metal piece and wondered what type of paint it was? It was probably a powder coated finish, which is an advanced method of applying a protective finish to practically any type of metal. It’s a sprayed powder that is a mixture of finely ground particles of pigment and resin. Once sprayed, the item is ‘baked’ at a very high temperature to cure the smooth finish and leave it with a sleek and durable ‘skin’. 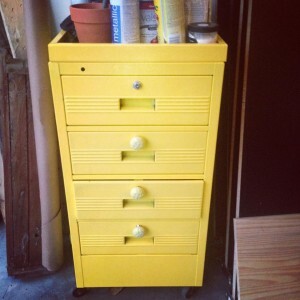 Here’s an old filing cabinet that we powder coated yellow. Powder Coated Finish: The Powder Coating process provides one of the most economical, longest lasting, and most color-durable finishes available for metal. Powder coated surfaces are more resistant to weather, chipping, scratching, fading, and wearing than other finishes. 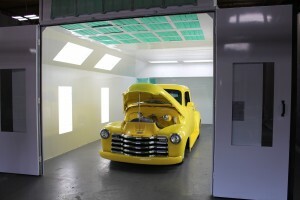 Powder coatings produce no drips, runs or sags. Edge coverage and coverage inside holes and nooks is exceptional. 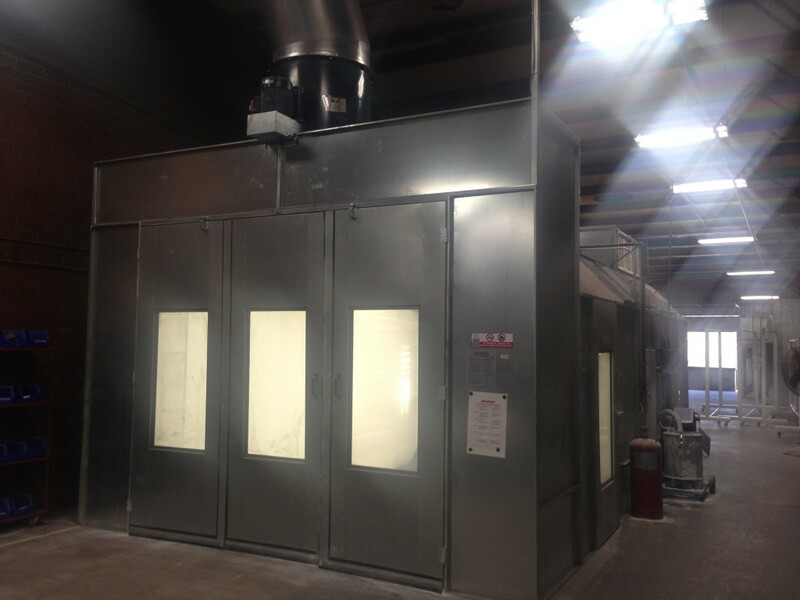 See the process from our Powder Coating production on this new blog. What about COLOR? If you specialize in powder coating, you can get virtually any color powder you want. Selection in the powder coating world includes flat, satin, gloss, high gloss, metallic, clear, iridescent, fluorescent, wrinkle, hammer tone, and glitter finishes. Colors stay bright and vibrant longer. Texture selections range from smooth surfaces to wrinkle or matte finishes, and rough textures designed for hiding surface imperfections. 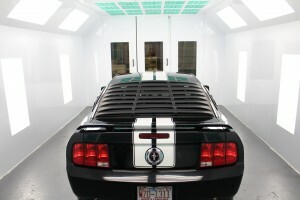 Powder Coating is also highly protective of our environment. While liquid finishes contain solvents which have pollutants known as volatile organic compounds (VOC’s), powder coating contains no solvents and release negligible amounts, if any, VOC’s into the atmosphere. Elimination of VOC’s and the reduction of waste saves money and helps companies comply with regulations from the U.S. Department of Environmental Protection Agency. At Standard Tools and Equipment, we offer a white powder coated finish if you prefer it to the galvanized steel look. This is an upgrade, but it is a more durable and environmentally friendly booth! 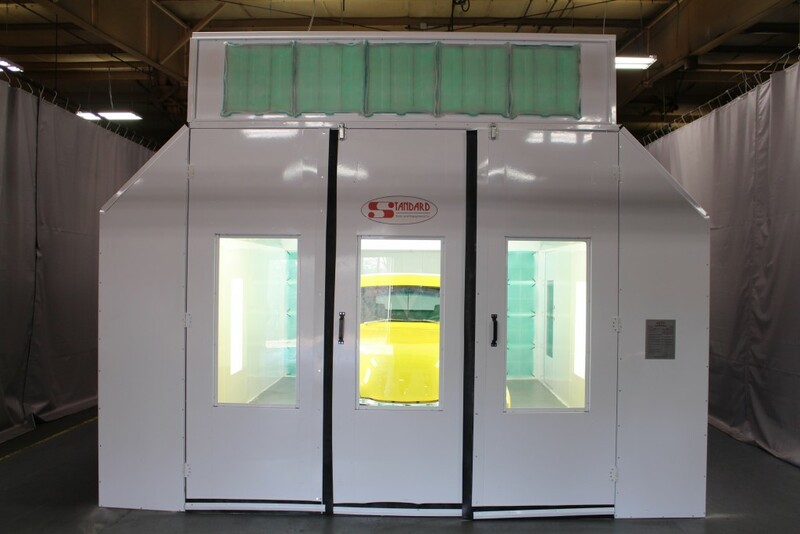 When you decide that you want your booth to be powder coated by us during production, we’ll send it into the powder coated process where we will coat every panel, both inside and out, prior to wrapping each panel for protection during shipping. 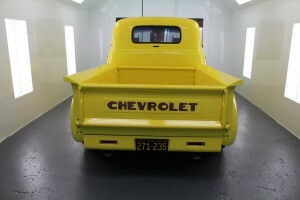 Why get your booth powder coated? Powder coating your booth white helps to evenly distribute the light and brightens your booth, eliminating shadows on your paint job. 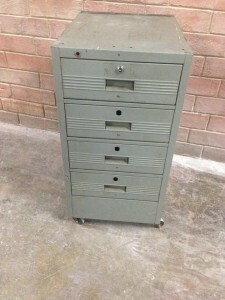 It will add longevity and durability to your booth so it will look great for years to come. 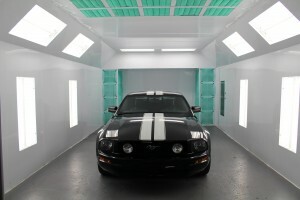 The price to get your Standard Tools Paint Spray Booth powder coated depends on the booth model and size. 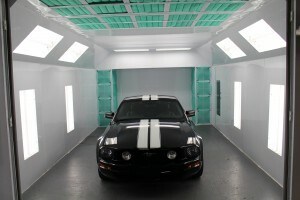 Give us a call today and ask about our powder coating! 888-312-7488. I like that powder coating your booth evenly distributes the light and brightens the booth. Shadows are not appealing in a paint job so that is something good about this as well. The booth just looks so shiny! I wish I had one of these to put my car in. Are these booths portable? Thank you…. we like the powder coated ones as well. They are not portable. Previous Previous post: Smiling New Paint Booth Specialist: Welcome Julie!